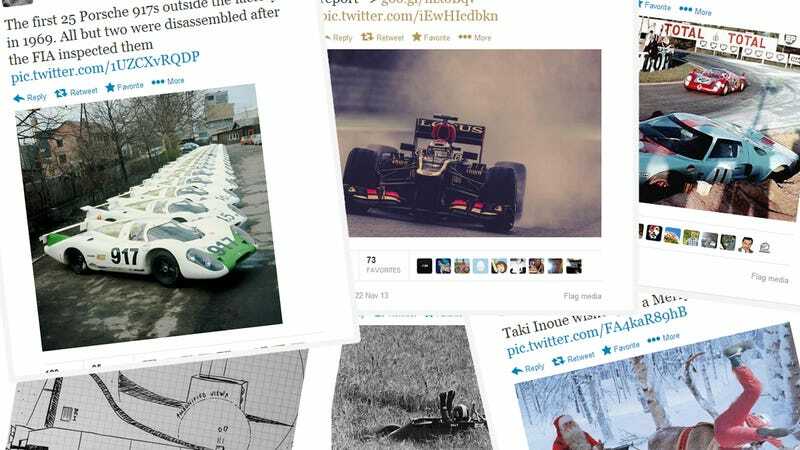 Twitter is the shortest way to nirvana in many cases, and apart from Jalopnik and Spinelli's Hair, these ten accounts deserve your gas-fuelled attention. If the real stats and F1 trivia makes you fall asleep, have no fear, all you have to do is switch to the alternative reality provided by BadF1Stats. Jordan is the Grand-Am champion from 2013 in the Daytona Prototype class. He also grew a mullet. He made movie and Seinfeld references every time SPEED interviewed him and gave away prizes on twitter to whoever picked up the subtle references. In addition to his two music videos he just bought a 65 C2 Corvette Stingray, "his dream car." When I first stumbled across his twitter feed I thought it was fake, then I did some searching and found that Taki Inoue really is that nuts. You need a monkey in your life. The is only one logical choice, Mike Spinelli&apos;s hair. Gonna give a mention to one of our own, Mr. @porsche914yr74. He RTs a lot of information about pretty much every race series on earth, plus livetweets of random syndicated Seinfeld episodes. Also a HT to @radiolemans and @specutainment, being Eve Hewitt and John Hindhaugh respectively. The combination is also a good bit of following for racing news. What more could you ask for in your feed apart from Jalopnik than what Racing History Pics has to offer? You'll need May to balance out Clarkson. This is what he does when not owning the year. Paying a guy to write funny tweets is much cheaper than Kimi Raikkönen.